Mitochondrion are a band from Vancouver B.C, Canada that has been featured before in this zine and plays a bestial and dissonant mixture of black and death metal and this is a review of their 2013 ep "Antinumerology" which was re-issued in 2017 by Krucyator Productions. A small amount of clean playing is utilized before going into more of a heavier and brutal direction along with a mixture of deep guttural death metal growls and black metal screams while the riffing also utilizes a great amount of dissonant structures and melodies along with whispers being used briefly. 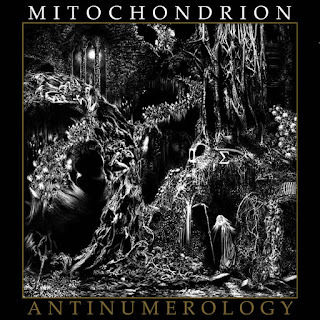 On this recording Mitochrondrion remained true to the dissonant mixture of black and death metal that they are known for, the production sounds very dark and heavy while the lyrics cover Apocalypse, Occultism, Disease and Gnosis themes. In my opinion this was another great sounding recording from Mitochonrion and if you are a fan of dissonant black and death metal, you should check out this ep. RECOMMENDED TRACK "Insummation". 8 out of 10.